From now until early summer is the best time to visit Saguaro National Park in Tucson, Arizona. The weather is pleasant with warm days and cool evenings. Cactus will be blooming and wildflowers may appear depending on the amount of rainfall. The majestic saguaro begins putting out flowers in April and peaks around Mother’s Day. Saguaro National Park is divided into two districts, the Rincon Mountain District on the east side and the Tucson Mountain District on the west. The Signal Hill Picnic Area where this photograph was made is in the Tucson Mountain District. From the parking lot, there is a short trail to the overlook where the rocks are covered with petroglyphs. Pecked into the rocks over a thousand years ago, these mysterious symbols were left for us to puzzle over by the Hohokum people. No one knows for sure the meaning of these markings; perhaps they guide travelers or are clan symbols or mark astronomical events. 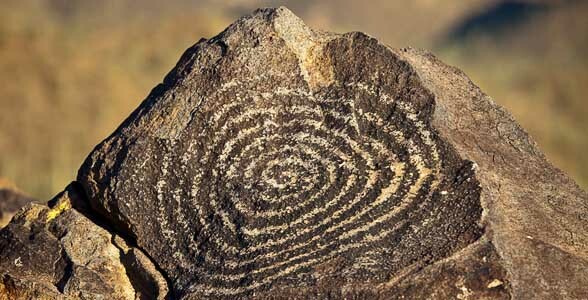 The most visible petroglyph is the spiral on the rock pointing up in the center of the panoramic view from Signal Hill. Technical Note: The panorama was photographed with a Canon 5D Mark II using a 45mm tilt-shift lens. I made three exposures, one with the lens centered, one shifted to the left and one shifted to the right. The three frames were then merged in Photoshop to create the final image. Wow, you really intrigued me with these photos. I will plan a visit of this area and probably book in some of the hotels in Tucson . These landscapes have to be seen and captured with my camera. Thank you for the information.